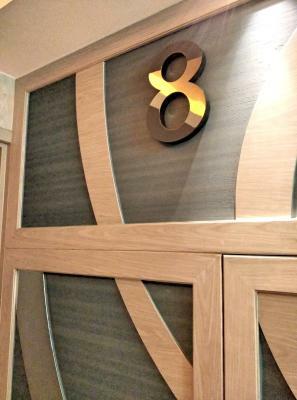 Lock in a great price for Sohotel – rated 8.2 by recent guests! The position, quite close to the center and soho district. Very nice! Every staff member I spoke with was polite, accommodating, and pleasant. Check-in was fast and easy. Breakfast was delivered to my room every morning as well as coffee, tea, or bottled water whenever I felt like it. The staff gave me an umbrella to use when there was torrential rain during my visit. 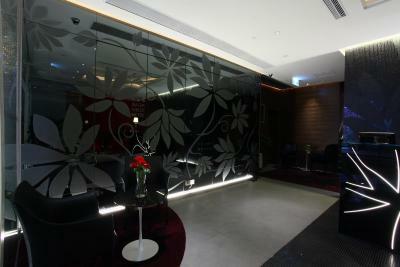 The location is very close to the 2nd airport (free) shuttle stop out of Hong Kong Station. There is also a metro stop close by. *Note* The room is very small but it worked perfectly for me. Breakfast was served inside the room without request. The lady serving was very pleasant. The morning staff in the reception were helpful. The staff is amazing, always with a smile and trying to help. Really, everyone was really amazing and friendly. 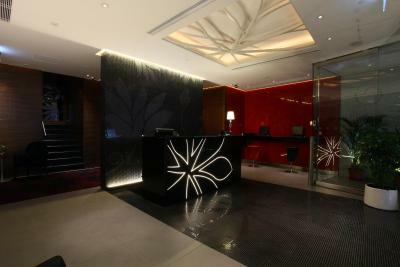 The staff were extremely polite and they tried to accommodate our needs as much as possible! For example, they noticed that we have leftover bread from breakfast and asked us whether we did not like that type, which in fact we didn't so they offered to replace that type with what we like instead! 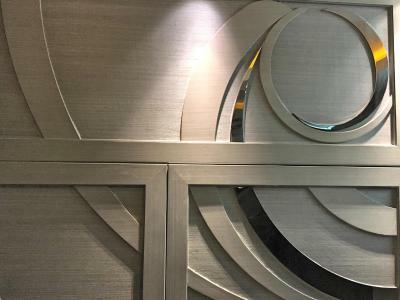 Easy to access from MTR Sheung Wan, super friendly staff and nice and clean hotel In Hong Kong, all rooms are small, that's just a fact. 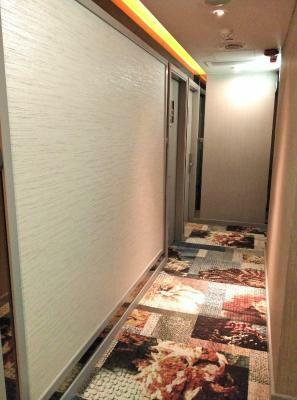 So are the rooms in Sohotel. 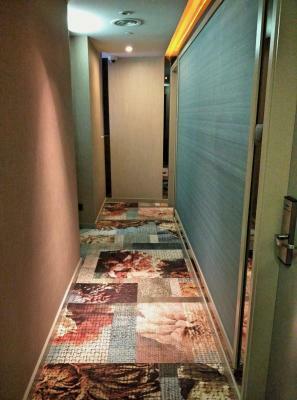 The hotel managed to decorate the rooms in a modern but cosy way to make up for it. 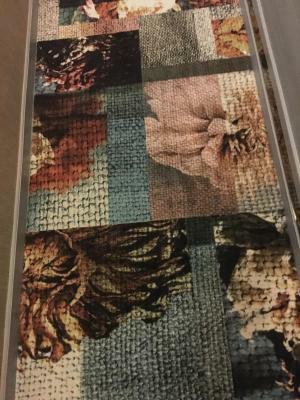 Very comfortable bed and pillows. 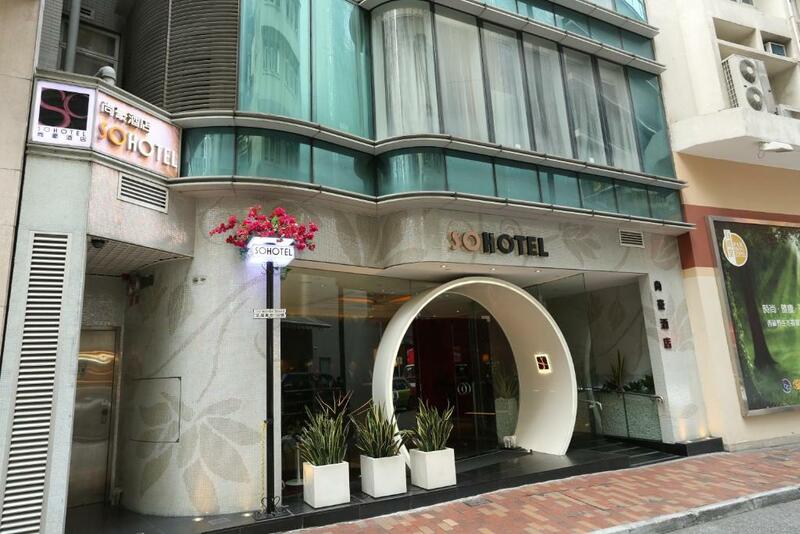 Sohotel This rating is a reflection of how the property compares to the industry standard when it comes to price, facilities and services available. It's based on a self-evaluation by the property. Use this rating to help choose your stay! 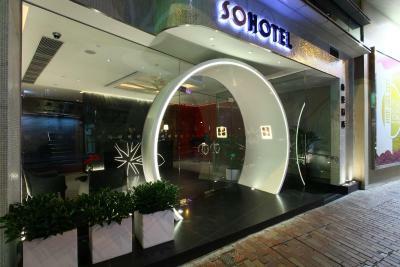 Less than 1,650 feet from the fashionable SoHo District, Sohotel Hong Kong offers stylish rooms with city views. Free Wi-Fi, free wired internet and free local calls are provided. A continental breakfast sent to the guests' room is also provided for free. 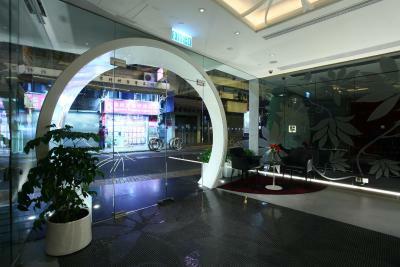 It is a 6-minute walk from Sheung Wan MTR Station and Sai Ying Pun MTR Station. Located at the heart of Hong Kong – Sheung Wan District, Sohotel is 16 mi from Chek Lap Kok International Airport. 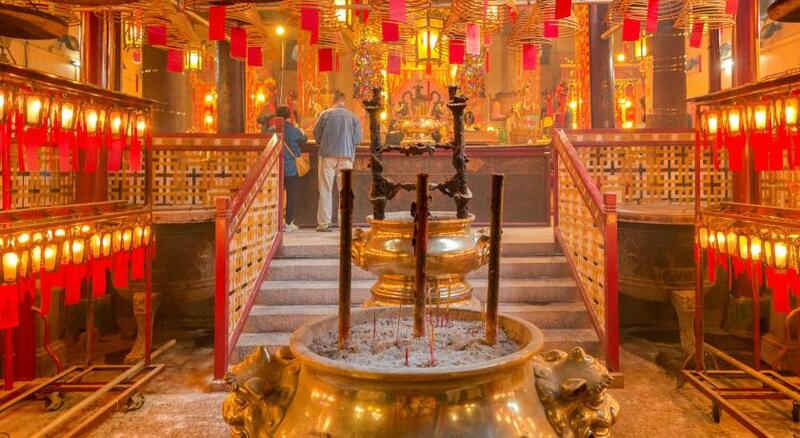 Attractions like Man Mo Temple and Victoria Peak are within 1.9 mi away. 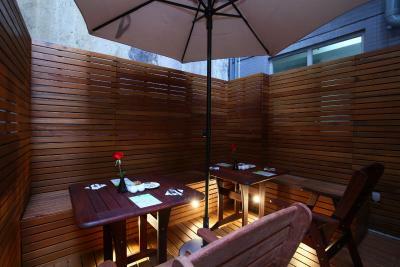 It is a 15-minute walk from Macau Ferry Terminal and the Outlying Island Pier. 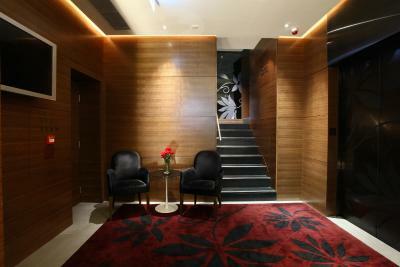 Rooms at Sohotel are decorated in dark colors to create a cozy yet modern feeling. 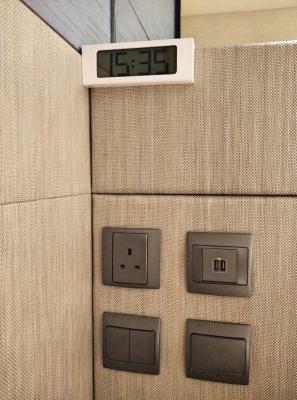 Each is equipped with a flat-screen TV and a personal safe. Ironing facilities and a hairdryer are provided on request. You can expect a pillow menu. Those in need can make use of the smoking lounge. A continental breakfast is served daily in-room. 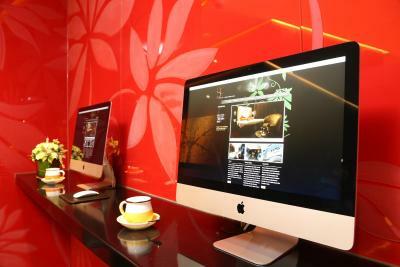 Guests can read emails at the hotel’s business center or make arrangements for day trips at the tour desk. 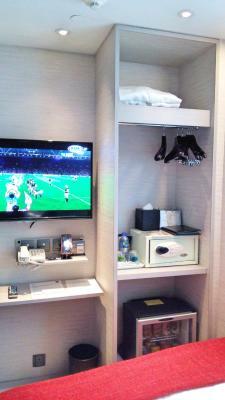 The hotel also provides laundry and postage services. 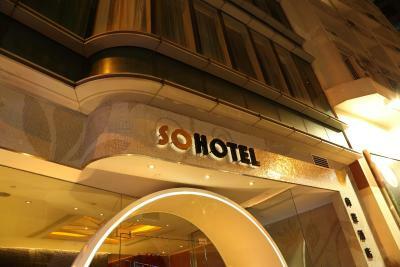 When would you like to stay at Sohotel? 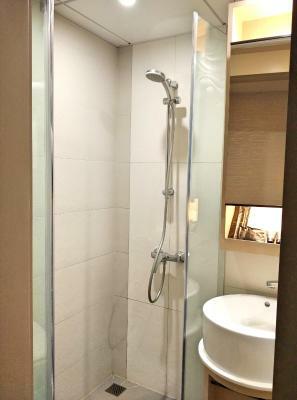 This double room has bathrobes, branded free toiletries, electric kettle and air conditioning in all rooms. Complimentary continental breakfast is served to guest rooms every morning. All-day complimentary tea and coffee will be sent to guest room. 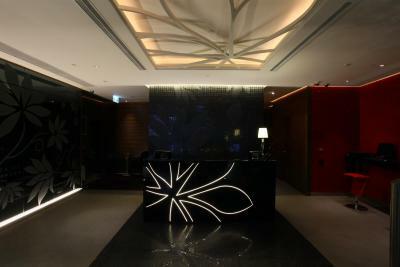 If guest is staying for 2 nights or above, free sim card for 4G internet, WiFi and WiFi hotspot will be offered. This double room has bathrobes, electric kettle and air conditioning. 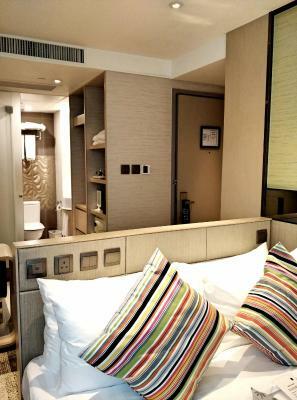 This twin room has a bathrobe, air conditioning and electric kettle. 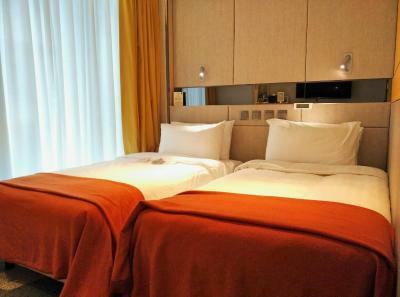 This double room has bathrobes, electric kettle, air conditioning and complimentary mini-bar. Mini-bar is complimentary along with welcome fruit setup and turn-down service. Complimentary American breakfast is served to guest rooms every morning. Complimentary airport express tickets are offered. Free late check-out time until 3 pm and it is subject to hotel availability. Free sim card for 4G internet, WiFi and WiFi hotspot is provided. Hotel offers 37 well-furnished rooms and suites to provide guests with top-notch facilities and services tailored to their distinct needs. 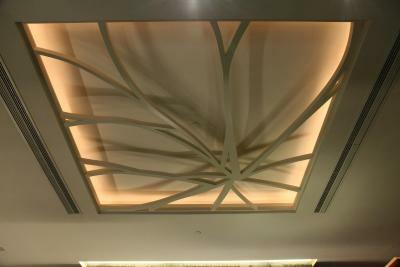 The hotel boasts comfortable accommodation around the year at reasonable rates. 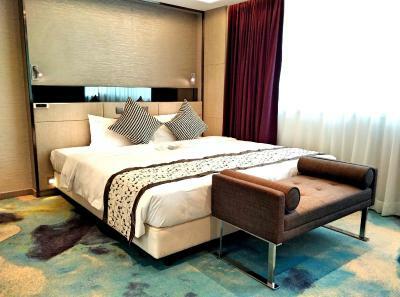 House Rules Sohotel takes special requests – add in the next step! 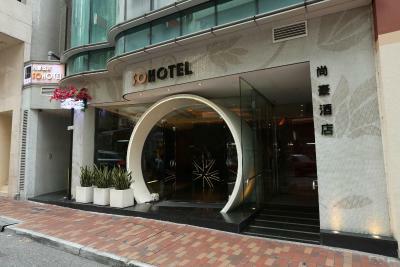 Any additional older children or adults are charged HKD 572 per night for extra beds. Sohotel accepts these cards and reserves the right to temporarily hold an amount prior to arrival. Please note that all rooms are nonsmoking. 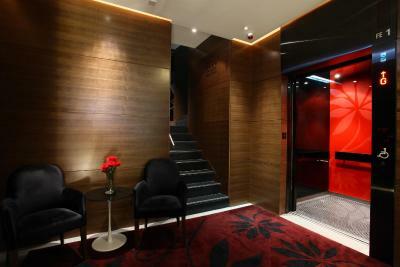 There is a smoking lounge on the 6th floor which opens 24/7. 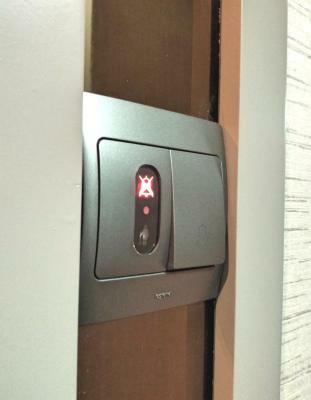 For security reason, please present the same credit card used to guarantee your booking when checking in and paying at the hotel. If you are making payment using another cardholder's credit card, kindly contact the property in advance for payment arrangement. Contact details can be found on your booking confirmation. 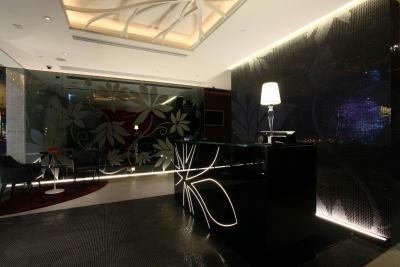 Please note that for all nonrefundable reservations guests are unable to modify the check-in name. 1) This advertised "Double room" size was totally misleading and a total shock! After arriving late at nite from Japan, where we had experienced tiny Hotel rooms, were were dumbfounded when our prebooked room Literally could not accept even one small suitcase on the useless space between bed and walls/furniture, let alone the 2 suitcases + bags we had w/ us. . How can a room be designated a "Double Room" when you can;t even set a suitcase down except by putting it on a bed??! Since we could not cancel this booking at this arrival date, we had to pay $54.00 MORE per nite just to be able to get a room where we could put our suitcases down....How could Booking.com allow this type Hotel to advertise Double Rooms where you can't even unpack 1-2 suitcases?? With the increased, extra costs, it made this Sohotel Hotel the most expensive of any hotel or House we stayed at all around Japan...ridiculous and unacceptable to put it mildly. Even though this rooms was marginally larger, we still had to maneuver and orchestrate the tight spaces each morning and nite to open suitcases, then repack and close and set upright, just to circulate around them. We could not even fully open the door to the hall without hitting the suitcase we had to stand in space inside the room. Really a pain and we are bitterly angry we had to pay the money for all this discomfort.....Booking.com must correct this listing with clear Warnings! Rooms very small but as expected in Hong Kong. Location is perfect for us as live to get out and about with the locals. Wi fi did not work whole time we were there. Staff good and breakfast is included. 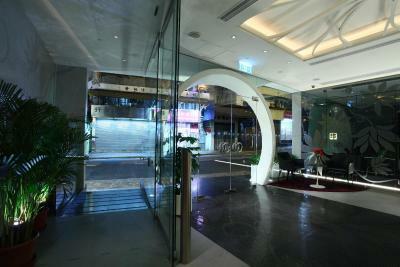 Location best easy access to MTR. Pricey for the tiny size of the rooms. Some noise from the street could be solved with double glassing windows. The room was very small, which wouldn’t have been an issue if the room was not advertised as luxury room. Breakfast was delivered by room service - not quite what I expected. Pretty central in Hong Kong - nearest MTR station is 1 stop from Hong Kong. 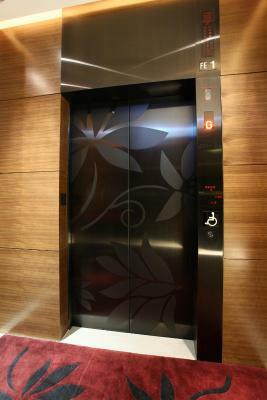 18 storeys - and one lift but I never waited long for it. Think there were only 10 rooms to a floor. My room was tiny and the bathroom even smaller - but everything worked and the bed and shower were excellent. Hotel lends you a free cheap android phone with good data connections - acts as your map without having to pay roaming charges or buy a local SIM. Maybe a gym and/or dining area to have breakfast at? The staff was amazing. Especially Sherman at the front desk. An absolute delight! Wonderful perks as well in terms of rooms/accommodations -- had four different types of pillows to choose from and they serve breakfast right up to your room so you can have it in bed. Small room, breakfast portion was a bit small. Very friendly staff, fast lift, tasty breakfast. Not a clean as before. Breakfast sandwiches not very good. The room was very small, breakfast did not start until 8.30 and had to be taken in the room. 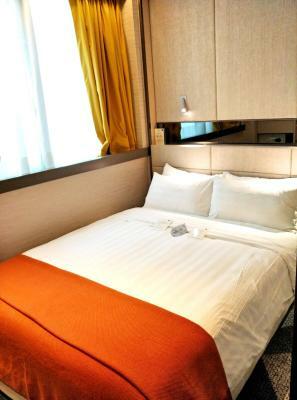 Welcoming staff, easy checkin/out, modern, very clean room, comprehensive toiletries good location, easy to get taxi to and from, convenient for Airport express.